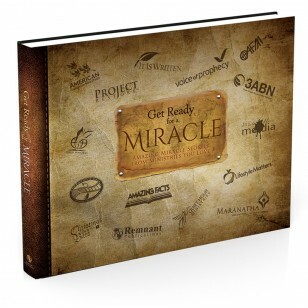 Get Ready for a MIRACLE is a beautiful Hard Back book, full of miracle stories. These miracle stories come from the Ministries you love. Beautifully bound, 117 Miracle stories on 367 pages. Powerful reading. Perfect gift to encourage and inspire anyone. Does your faith need a boost? Do you think that miracles only happened in Bible times? Think again! These remarkable accounts are drawn from the experiences of ministry leaders and workers. They prove that when we step out in faith, God displays His power in undeniable ways. You’ll read of a dying man whose health was dramatically restored. A $50,000 check arrived just at the right time. A rainstorm saved a girl from danger. Learn from literature evangelists, school principals, missionaries, among others. They witnessed God’s unquestionable protection and provision. These devotionals will inspire you that God can turn a bad situation into a blessing. If you want to see miracles performed, prayers answered, and lives transformed, just go on a mission for God. Perhaps even in your own backyard.